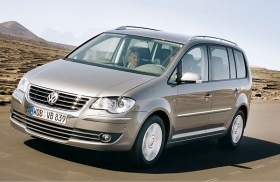 More than half of VW Tourans affected by the recall are in Germany. BERLIN (Reuters) -- Volkswagen is recalling almost 6,000 gas-powered Touran medium minivans worldwide to replace the models' front gas bottles, it said. Of about 5,900 affected Tourans from the model years 2006 through 2009, some 3,800 are registered in Germany, Volkswagen's home market, it said.